This has been an early winter for South Florida. We’ve already had at least two hard freezes. The temperature for the night of the ride was going to be around 50 degrees at the start, and dipping lower as the evening went on. The nap magnet had captured me late in the afternoon. I was all snuggled up under warm blankets enjoying the sleep of someone who has a clear conscience when a phone call woke me up. I looked at the time and realized that I had a decision to make: blow off the ride and stay all toasty or try to find my bike stuff that was still scattered all over from my trip to Missouri. When I got to the start of the ride at Southern and Flagler, I was glad I opted to ride. The wind was calm and it wasn’t as cold as I had feared. 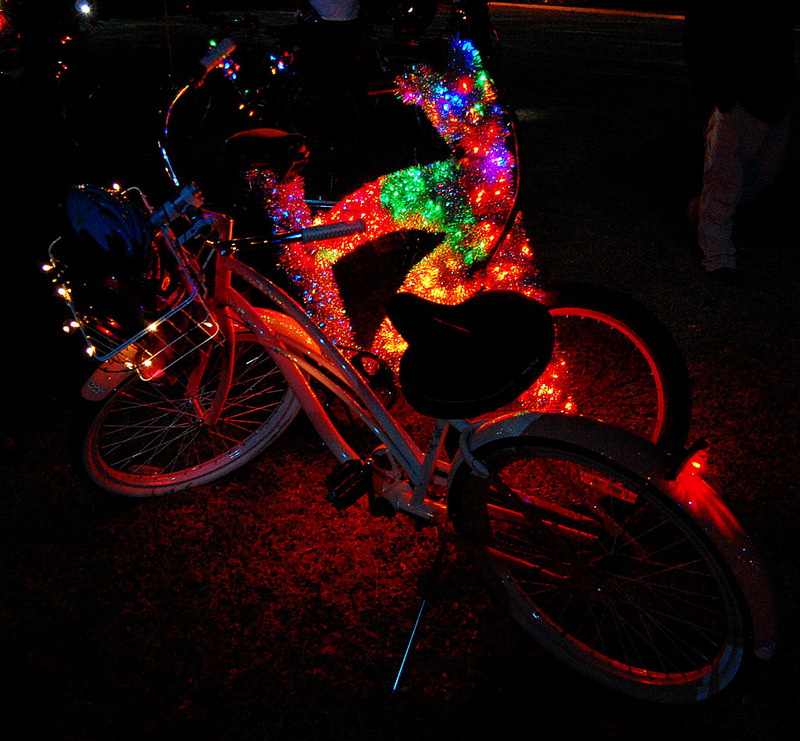 Seeing all the familiar faces and decorated bikes warmed my spirit, too. I missed the June ride because of my high school class reunion, and we were in Missouri for my mother’s Birthday Season in October. 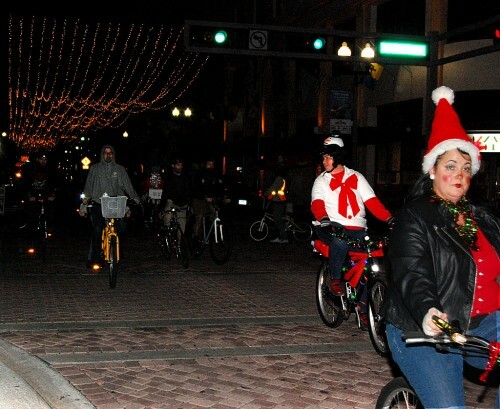 The last Choppernite ride I was on was last year at this time and I raised some serious safety concerns. I’m pleased to say that Wednesday night’s ride was a vast improvement over last year. Most of the bikes had lights fore and aft. Those that didn’t were generally tucked securely in the group. Helmet usage was up and the organizers encouraged their use. Riders were more disciplined: they stayed within the lane and generally rode responsibly. 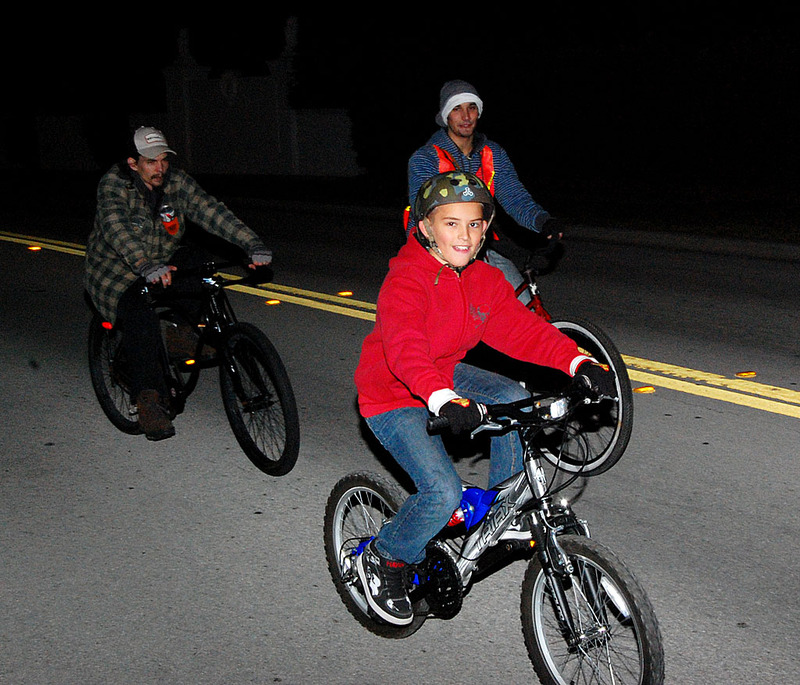 The “corkies,” riders who would block the intersections so the ride could go through as a group, were dressed with reflective vests and did a great job of engaging with the motorists. I heard several of them explaining what the ride was all about and thanking drivers for their patience. I didn’t hear any of the impatient horn honking that happened at last year’s Choppernite. I did another holiday ride the next night. Look for those photos and videos in the next day or so.